We’ve all been there: we’ve all been rejected for something. Perhaps you didn’t get into your first-choice college or university. Perhaps you tried out for a play and didn’t get the part. Maybe you applied for a job and didn’t get it – even after a fantastic interview. But that’s life, isn’t it? Why then do writers seem to feel especially slighted when agents or editors pass on their work? My own work has been rejected numerous times by agents, publishers, and I suppose by readers who decided not to buy the books for whatever reason. But I’ve also had successes – that first publisher said ‘yes’, I received the odd royalty cheque so some readers have said ‘yes’. What do these rejections look like? And how do you cope? 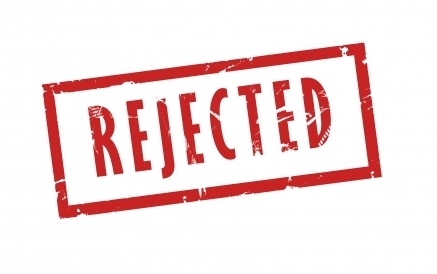 In my view, rejections come in three packages: the total-lack-of-response rejection, the form-letter rejection, and the almost-form-letter rejection. Let’s look at each one in turn. I think this is the most frustrating kind of rejection – because you’re never sure when it has kicked in. In my experience, this happens most often with literary agents. Publishers will usually at least send you a form letter. When a publisher’s or agent’s web site says, “If you haven’t heard from us within three months, you can consider that we’ve passed on your project,” I see red. Although it is true that publishers are swamped with queries and manuscripts from wannabe writers, it seems to me that the writers who took the time to contact them at least deserve a form-letter rejection. After all, if you’re a publisher or a literary agent, you signed up for this. Providing even a form rejection would allow the writer to move on. This kind of rejection is especially galling when they have also asked that you not submit to more than one publisher at the same time: the multiple submission. The time it then takes to move on is unacceptable. This is just disrespectful. The form-letter rejection is so ubiquitous that some writers paper their walls with them. In the old days (and still today for some dinosaurs of publishers and agents), the submission requirements would indicate that you were to provide a SASE (self-addressed-stamped envelope) with your submission so that they could send you a photo-copied form rejection. Not for a single moment did I believe that if they really intended to accept my manuscript they would object to footing the bill for a stamp, or even better, a telephone call. What’s interesting about this, is how when tweaked a bit, it can make you believe you have received a personal note of rejection, when it’s really a form. But don’t kid yourself. So, the work just wasn’t a good fit. I feel better now. Not really. There is nothing in any of these to suggest that the work is good, bad or indifferent. And I wouldn’t expect it to say that. What you need to understand about these rejections is that they do not reflect any kind of assessment of the value or quality of your work whatsoever. They simply mean the agent doesn’t want to represent you. Occasionally, you do receive a much longer letter from an acquiring editor whose interest was, at least, momentarily piqued. These are much longer letters that often even suggest other publishers or agents that might be a better match or who might actually be looking for your kind of work. If you don’t receive a note that is longer than three or four lines, understand that it is what they always say – even if the work is a piece of crap and they think so. If editors or agents are truly besotted by your work, they’ll say so, and they’ll ask for more. Continued rejections, however, should make you re-examine your work before running screaming into self-publishing. Once you’ve determined that it’s truly your best work, then go for it — take control and self-publish. Previous Who will buy your book? I believe someday literary agents will go the way of the dinosaurs. Authors, with the exception of the “big names” with established followings, are fed up with the traditional gatekeepers (and publishers, for that matter) who heretofore have prevented their books from being published. Self-publishing allows the reading public to be the judge of whether a work is worthy or not, and that is the way it should be. Rejection is something with which we all must deal from time to time. The normal rejection letter from a literary agent, however, is akin to an insult, giving the author absolutely no information as to why his or her work has been rejected, and often written poorly enough that one wonders how the person writing it managed to secure a job in the literary industry. It is not enough to say one’s work does not “fit their list”. We need to know WHY it does not fit and what DOES. If agents would even ATTEMPT to be helpful with their rejection letters, I would feel more charitable towards them, but to receive form rejections, with no constructive criticism of the query or the sample submitted, and written by someone who often does not have the writing ability of the prospective author, is a potent motivator to self-publish. They certainly convinced me! I actually get the feeling these days that literary agents are developing a defensiveness that speaks of their feeling of vulnerability in the new landscape of publishing. The latest wrinkle seems to be the agents’ push to make themselves useful to self-published writers. I don’t see that happening any time soon, though. In the meantime, I sometimes go through the motions. I’ve actually had two agents in my writing career — neither of whom was successful for me. One of the books I later placed myself with a publisher. I think this is my last foray into agent land! Thanks for your astute comment, David! You’re welcome! I hope the agents take this vulnerability to heart, for I believe they are in dangerous territory. Technology has already displaced thousands upon thousands of workers in America, and though literary agents are not in the traditional labor force, a different type of technology, that of POD and e-book self-publishing may soon make their jobs obsolete as well if they do not change the way they relate to writers. I hope you are right about the change in attitude, as many would-be authors could definitely use the help.